Women in the United States have taken a step closer to closing the wage gap, according to the U.S. Census Bureau’s new report on income, poverty and insurance coverage in 2016 released Tuesday. 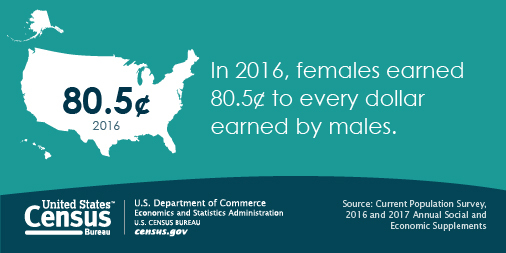 In 2016, women earned $0.805 for every dollar earned by men — up from $0.796 in 2015. While the wage gap remains substantial, this was the first time since 2007 that the female-to-male pay ratio had a statistically significant annual increase. This change has happened over a period during which overall household incomes have also risen — to the highest figure ever measured by the bureau. With median household income reaching $59,039 in 2016 and the highest number of households ever recorded earning more than $200,000, strong consecutive income gains in recent years have made wage-earners better off, as household income now exceeds pre-recession levels. Still, even as income gains have driven poverty rates down from 14.8% in 2014 to 12.7% in 2016, there are still more female-headed households in poverty, and the poverty rates for female-headed households remain deeper. Here’s what the report shows if you dig into the data. Median household income was up 3.2% in 2016, with the median income of $59,039 exceeding 2015’s median of $57,230 by more than $1,800 per household. This was the second year in a row that median household income increased, bringing good news for the middle class. Both men and women experienced earning gains, but men still earn substantially more than women on average: Median earnings for women reached $41,600 in 2016, while median earnings for men were $10,000 higher, at $51,600. Still, 80.5% ratio of male-to-female pay is a significant improvement compared with just decades ago, in 1990, when women earned around 70% of what men did, and the narrowing gap likely reflects slow but steady progress in efforts to close the wage gap. One unfortunate nuance? The reason for the closing gap is at least in part the fact that the average U.S. man has actually lost ground in his wages since 2007 once you adjust for inflation, while the median woman earned 2.3% more in 2016 versus 2007 by that measure. As incomes rose, Americans’ poverty rate fell to 12.7% in 2016, with 2.5 million fewer people living in poverty that year compared to a year prior. The poverty level has now reached lows not seen since 2007, prior to the financial crisis. However, among the 40.6 million people living in poverty, women still have a higher rate than their male counterparts and are more likely to face larger income deficits: Women have a 2.7% higher rate of poverty than men among all age groups. The gap in poverty rates is lowest among women under age 18, with only a 0.8% gap. But among women and men ages 18 to 64, the gap is 3.7% — and among women and men aged 65 and older, the gap is 3%. The income deficit for female-headed families is also greater for men than for women: $3,313 for women-led households versus $3,031 for men’s. Female-headed households have a larger income deficient than the average of all families living in poverty, who have a deficit of $3,058, and a much larger deficit than married couples in poverty, who have a deficit of $2,749. More wage gains for women overall could help bring poverty rates down for female-headed households. For more information about the gender pay gap — and ideas for solutions — check out Mic’s prior coverage here and here. And read more about the new census report, with breakdowns by age and race, here.